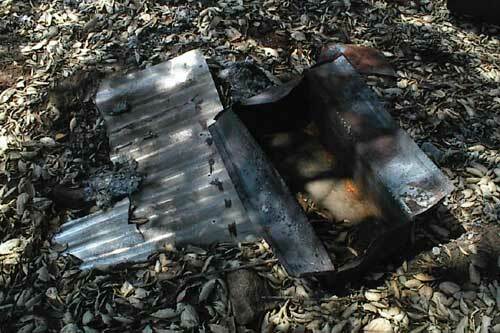 The welcome sign, partially burned, rests at the entrance to the camp. No human intervention propped the sign against the gate. Fire burned up the supporting post, dropping the sign neatly upon the gate behind. If I don't remember anything else about camp, I'll always remember the cruddy, so-called "food." On a hike towards Stonewall Peak, we saw a overly full stream. 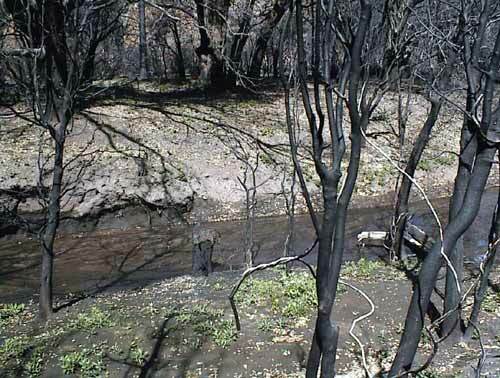 After October's fires, there's no vegetation left to trap ground water. But there are slight signs of hope as the green returns. 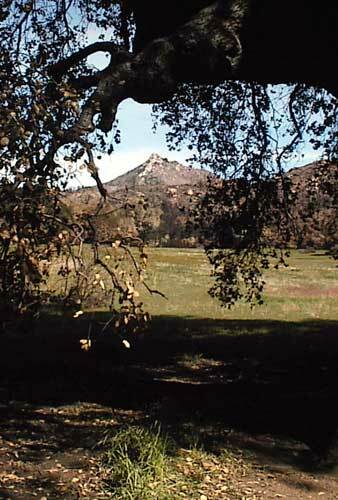 Here is Stonewall Peak, all the more spectacular after being cleared by the fire. This view (from the south) of the now naked mountain is sparcely related to the pictures taken last Labor day (from the west and top), just 7 months ago and 2 months before the fire. An old legend around camp, the ancient oak tree was the destination of our hike. We stopped and ate snacks and heard the story of the early Cuyamaca pioneer who was going to log the tree for the basis of his cabin. As he swung his ax for the first blow, the settler could not remove his tool from the grip of the tree. The story teller pointed up into the tree. We all looked up and witnessed the original ax, still locked into the tree's gigantic arm. Ed. note: A chip off the old block: Brad gets artistic and frames the picture inside the branches of the oak tree...just like his father would have done. 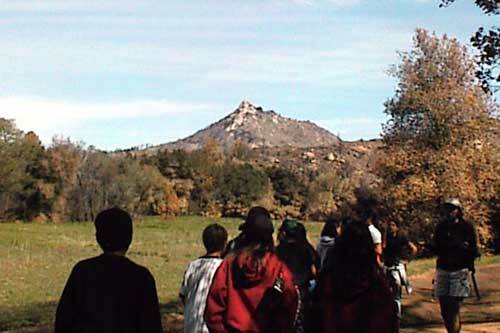 On Wednesday, our group of 15 students went on the ADA, or All Day Adventure. 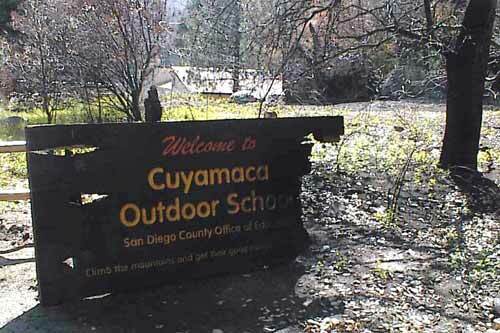 We took a bus to the outskirts of Cuyamaca State Park to the only trail in the Park untouched by el flamo. Four of seven men in the group carried 30 pound back packs containing lunch, water, and first aid down a deep gorge. I was one of them. 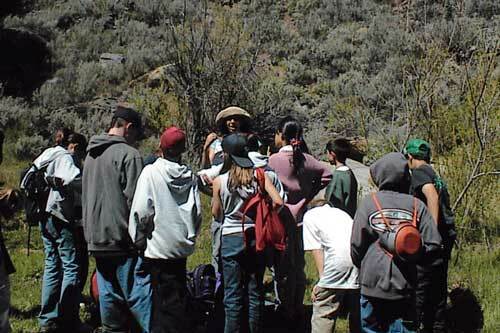 When we got to the bottom, we crossed a large expanse of pond and gobbled down the edible contents of the backpacks. A little way off the camp, the fire ripped through an RV park. They told us this was a tool box and storage shed. It was all contorted and melted and stuff. The boys' cabin was divided into four "dens." All the dens are gathered here for a boys versus counselors "slider" competition, which is a game were you get on your knees and try to slide a small square tile across the floor so it stops on a box that's painted on the smooth concrete ground at the other end of the den. The girls on the other hand, had a fashion competition.